Takes cognizance of BCECEB Communiqués in respect of BCECEB ITI CAT 2019 / The Bihar Combined Entrance Competitive Examination for Admission into various Professional Courses in different Engineering Colleges, Medical Colleges, Agriculture Colleges under the Government of Bihar is being conducted by Bihar Combined Entrance Competitive Examination Board as constituted under the Bihar Combined Entrance Competitive Examination Act, 1995. Applications are invited from 14th March 2019 to 05th April 2019. Earlier last date of online application was 03rd April 2019. Online Registration commence with the Dates notified in the Advertisement released by Bihar Combined Entrance Competitive Examination Board. We do look forward to Bihar Combined Entrance Competitive Examination Board to officially release towards March – end 2019 its Notification in respect of the BCECEB ITICAT 2019. Minimum Age 17 Years In case of Vehicle / Mechanical Motor Vehicle / Mechanic Tractor. Minimum Class VIII / Middle Class from any School recognized by the Central Government / State Government. Higher Secondary Certificate Examination / Senior Secondary School Certificate Examination (10+2) Intermediate from any Board of Secondary Education recognized by the Central Government / State Government. However, Details shall be published in Bihar Combined Entrance Competitive Examination Board Advertisement. Bihar Combined Entrance Competitive Examination Board shall release the e-Admit Cards / Hall Examination Tickets Two / Three Weeks before the Industrial Training Institute Common Admission Test (ITICAT) 2019. Bihar Combined Entrance Competitive Examination Board notified ITICAT shall comprise the Multiple Choice Questions of Objective Type. Bihar Combined Entrance Competitive Examination Board is likely to host in May 2019 the Industrial Training Institute Common Admission Test 2019. The Shortlisted Candidates shall be required to carry along with them among various documents, Educational Qualification Documents / Testimonials in support of their respective Caste Certificate duly Attested / Residence Proof along with the Admit Cards, etc. for verification at the time of admission. Name of the Industrial Training Institute Counseling / Interview Dates Category / Merit No. Bihar Combined Entrance Competitive Examination Board has published the detailed Counseling related Information in the attached two Portable Document Format Files at the end of the Write-up. In case of Clarifications, Assistance the Candidates are advised to www.bceceboard.bihar.gov.in. 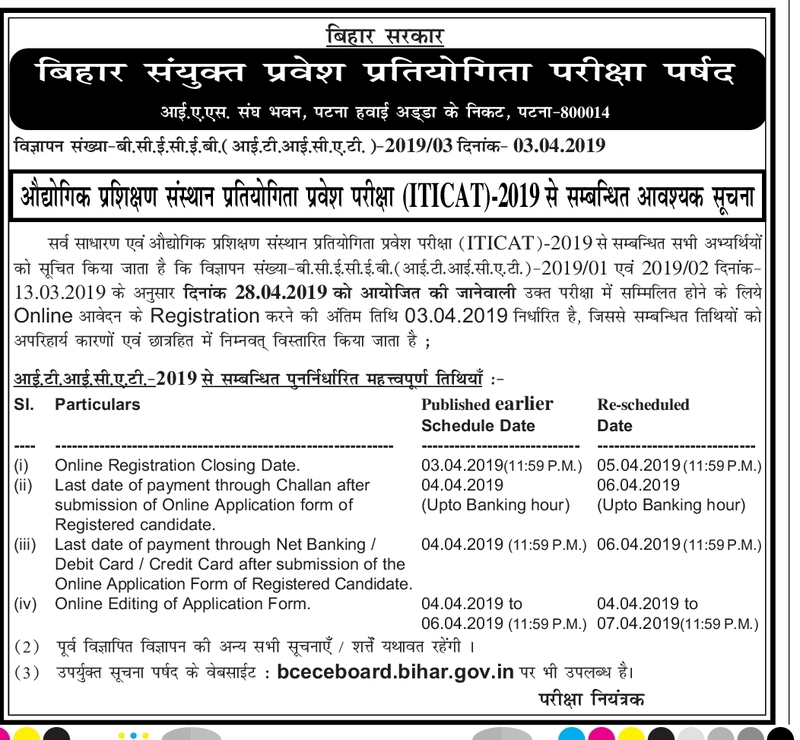 Issuance of Online Admit Card Two / Three Weeks before BCECEB ITICAT 2019. Press Click here on BCECEB Website for Online Registration.